We thought we'd take a break from our usual bleeding edge economic commentary to focus on a topic most of us would rather forget this time of year. Taxes. 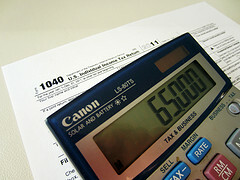 Yes, April 15th is rapidly approaching and with it a plethora of tax errors that could be easily avoided. Here are a few tax filing mistakes to guard against. 1.Signatures: Don't be the schmuck who forgets to include his or her John or Josephine Henry in a couple of critical places, resulting in your tax return being returned and likely racking up a late fee in the process. The form itself must be signed and dated, as well as the payment check, if you have the misfortune of being required to include one. Just remember, the IRS and your Uncle Sam aren't fond of anonymous filings. Along this line you should remember to include the proper postage and for gosh sake use the government's pre-printed label and envelope. o avoid at all costs. The secret here is to blend into the background. 3.Use the correct table: Check, double-check, and maybe even triple-check that you're using the correct tax table in your calculations. Screw up here and you risk paying too much for your investments, etc. 4.Understand the extension: It's fine if you decide to ask for an extension to the April 15th filing deadline, just understand that you will pay a late filing fee as well as interest on any payment that might eventually be due. In order to obtain a legitimate extension, Form 4868 must be sent to the IRS by the original deadline. Even though the vast majority of extensions are granted automatically, don't make the mistake of assuming you don't have to ask for it. Last but not least, don't immediately opt for the 1040 EZ form just because you qualify. This simple form doesn't allow the taxpayer to maximize tax savings and refunds. For example, it doesn't offer the ability to deduct student loan interest, alimony, charitable deductions, and other common expenses. To claim these, you need to fill out the full strength 1040 form.